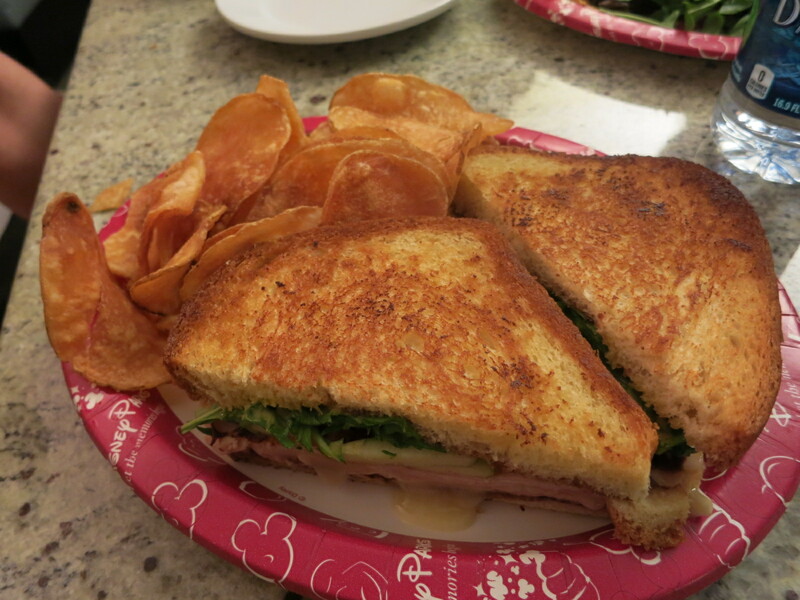 Contempo Cafe is a quick counter service restaurant located in Disney’s Contemporary Resort. They serve breakfast, lunch, and dinner and they have hot meals as well as some grab and go snacks and drinks. Since my family was staying here, we thought we would give it a try a few times for a late night meal and breakfast. They have electonic kiosks where you place your order and then you can pay for it while they make your food. They have a bunch of flatbreads on the menu so we gave the marinated beef flatbread a try ($9.69). It is topped with a goat cheese spread, oven roasted tomatoes, caramelized onions, and fresh arugula. I wasn’t expecting much from this flatbread, since we ordered it at 10pm from a fast food place, but it was great. The flatbread was thin and crisp enough to hold up to the toppings. The goat cheese spread was rich and creamy and it went well with the juicy and tender marinated beef. 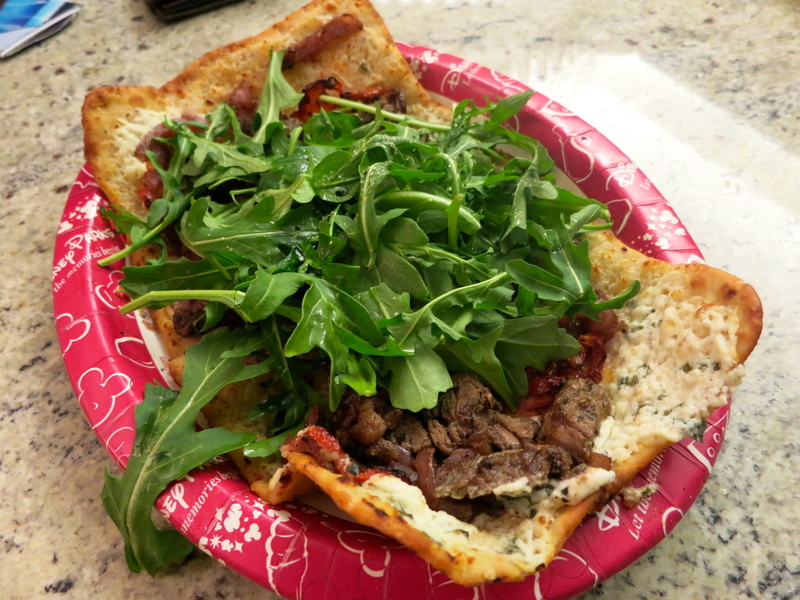 The arugula helped to freshen up the flatbread and balance out the heavy meat and cheese. I was equally impressed with the hot smoked turkey sandwich ($8.99). The sandwich is piled with turkey, brie, arugula, green apple slices, apple butter, and honey mustard served on toasted challah bread. The big slabs of melted brie cheese is what made this sandwich special. It was warm, and melty and perfect for when you are craving something indulgent late at night. I also liked the apple slices on the sandwich. They added a fresh crunch and a bit of tartness. For a side you can choose fries, green bean salad, or house made chips. We got the house made chips and they were tasty. They came out very hot and crispy. It is a nice touch to see them fried up fresh, instead of having a bag of pre packaged chips. Surprisingly, the vegetable flatbread was just as good as the beef one. 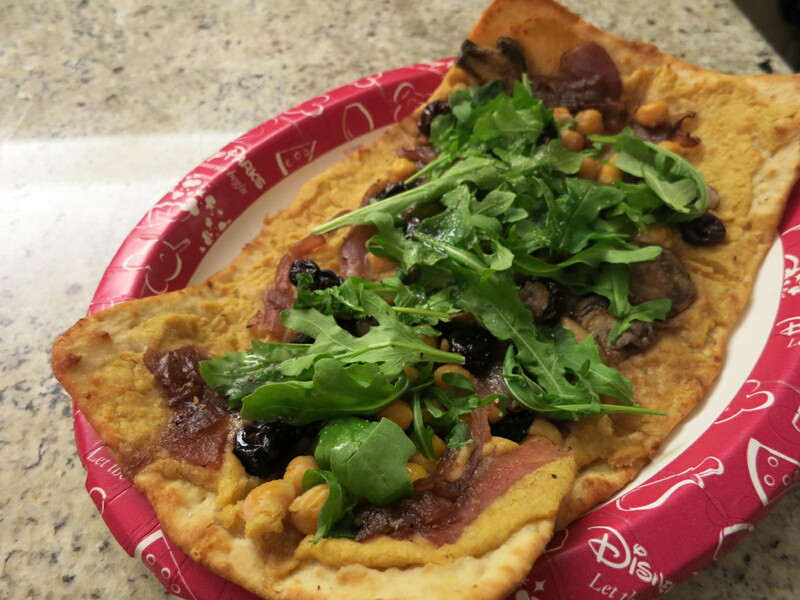 It is topped with a spread of hummus, mushrooms, caramelized onions, chickpeas, dried cherries, and arugula. There was a lot of flavour packed into this vegetarian dish. The hummus and chickpeas made it hearty and filling and I loved the sweet flavour from the cherries. Whether you are a vegetarian or not, this is a great and healthy meal. A couple of days later we came back for breakfast. I ordered the breakfast burrito ($5.99). 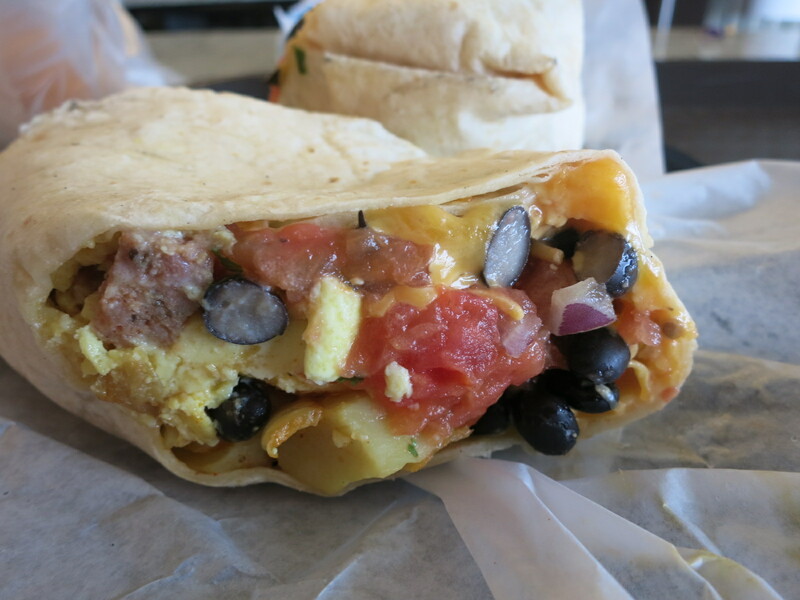 It is filled with scrambled eggs, chorizo, potatoes, cheddar cheese, charred tomato salsa, and black beans. The picture they have up of the burrito make it look tiny, but don’t be deceived, it is large and filling. I was pleased and satisfied with my choice. They were generous with the fillings and there was lot of fresh salsa inside to give it moisture. It wasn’t too cheesy, which I liked, because it allows you to taste the other ingredients inside. If you are looking for a filling and cheap breakfast, this is a good option. I also ordered a side of grits ($2.79) because I didn’t realize how large the burrito was. Before this point, I had never tried grits for breakfast. Grits have Native American origins and they are a popular dish in the Southern United States. They are made with a type of ground up corn called hominy. 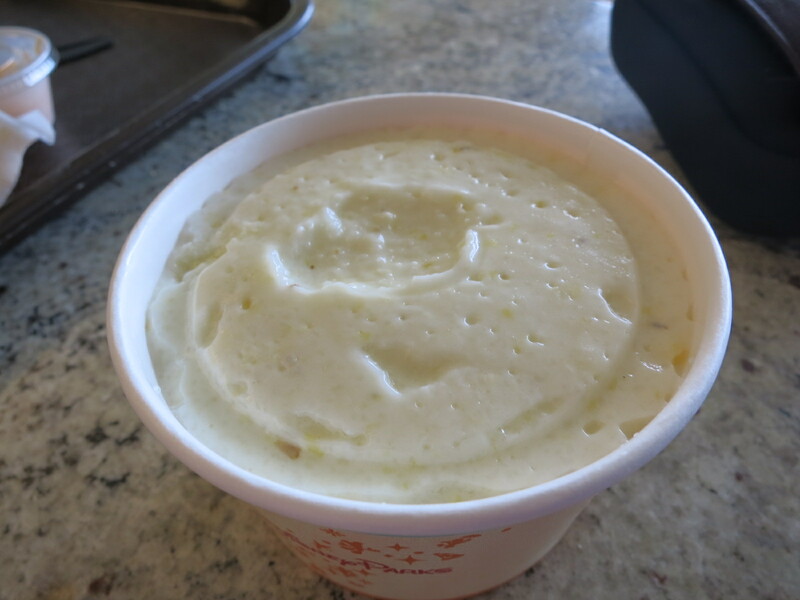 I love porridge style food, like oatmeal and congee, and grits have a similar texture. They are so simple, but I fell in love with them because they are so comforting. They have a mild corn flavour and a thick creamy texture. I think these are a great breakfast food because they are filling and not too greasy or hard on your stomach in the morning. Yes, for affordable, quick, and good food.